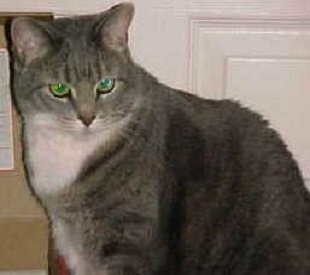 The definition of a non pedigree cat is if they do not belong to any of the recognized pure breed cat groups. In Britain they are popularly known as mobies and sometimes in the United States they are known as alley cats. In the dog world they would be known as mutts. Even though these cats are not pure bread they may exhibit characteristics of an established breed. There is nothing to suggest that non pedigree cats are in any way inferior to there more up scale cousins or purebred pedigree cats. A non pedigree pet like our big 26lb Riley pictured on the right may have the finest characteristics of a particular pedigree. Meaning the best part of these purebreds are contained in a mix known as the domestic feline. In many cases you will find that this domestic cat has fewer health issues, a calmer temperament and will make for a better pet. One of the primary reasons for this is that over breeding and genetic manipulation of a pedigree cat may cause inherent health problems. A shortened life span and less then desirable temperament is also a real possibility with some breeds. An example would be the peak faced Persian. They bred this cat to have a shortened nose and have a flat face style profile. Breeding has resulted in breathing and airway problems for this particular breed. You might also find that this animal develops tear duct problems and has an improper closing of the jaw. This can create eating difficulties as well as several kinds of cat dental problems. A study from a few years back, noted that 1.5 million cats in the United States qualify as a pedigree animal. The definition of a pedigree cat is that the feline needs to have a family tree stretching back through four or more generations of registered parents grandparents and all of the same breed with no indiscretions. This cat also needs to be registered itself with the appropriate governing and registration body. Registration of the pedigree cat can be very difficult because most pet cat parents can not be identified for certain. In Britain they have a governing Council for breeding. This council recognizes over 100 breeds. In the United States it is more complicated, because there are several registration organizations, which do not agree on the accepted and approved breeds. 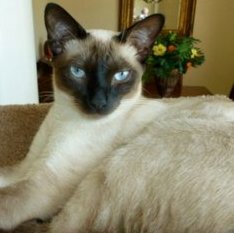 Help people find this non pedigree cat page with a bookmark or share.